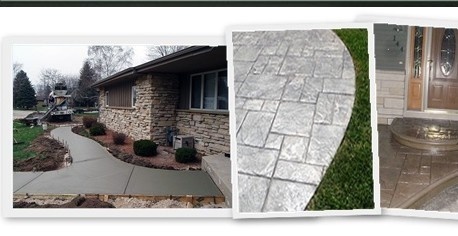 Spencer Concrete specializes in decorative stamped concrete patio, driveway, basement concrete floor, garage slab, and concrete floor projects. We can pour, install, replace, remove, & apply any concrete / cement flatwork installation applications. Spencer Concrete also is a custom shed, garage, & ICF concrete home builder. We also offer winter ice & snow removal service for commercial parking lots, and residential driveway snow removal services. 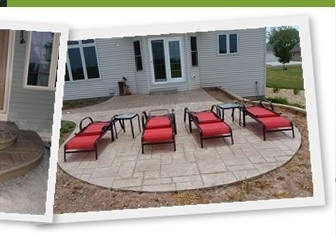 Whether your project is a decorative stamped concrete patio, concrete driveway, or a garage build package make Spencer Concrete your quality concrete contractor. 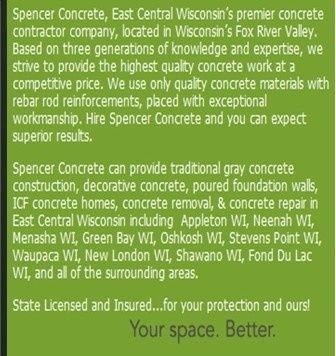 If you’re looking to hire one of the best local Wisconsin concrete contractors, please look at our concrete service page, to see if Spencer Concrete company could be your concrete contractor. If you are interested on a price cost for a gray or decorative concrete patio, new concrete driveway, existing concrete removal and repair, garage slab, ICF concrete home build, concrete floor, or any concrete project please contact us for a no obligation concrete bid.